It’s raining in Aix-en-Provence…one can’t complain…it is the first since the beginning of our holidays so we take it easy…the girls have created a pop-up restaurant in the lounge with all the cushions they could find in the house…it’s a mess (happy) but there is ‘Apl pie‘ on the menu! And then there is the latest copy of Marie-Claire Maison and the work of Mark Eden Schooley, an American photographer who lives in Paris. Poetic shots for Hermes, inspiring homes for Selvedge, Elle Decor…. Clearly a women with expensive taste! And why not! Lovely white images! I gotta sort out my pictures! i love the lamp too….beautiful! Fantastic Desiree, I will check out your post about MERCI. Today, I had a meeting with my Design Hero, Jacqueline Morabito and I still cant believe it had happened and how lucky I feel…so many great things are going to happen in the near future! I cant wait to get back to work and work on them! Ohhh magnifiques clichés, j’adore ces ambiances blanches et méditerranéennes… Bon shopping au Sud!! 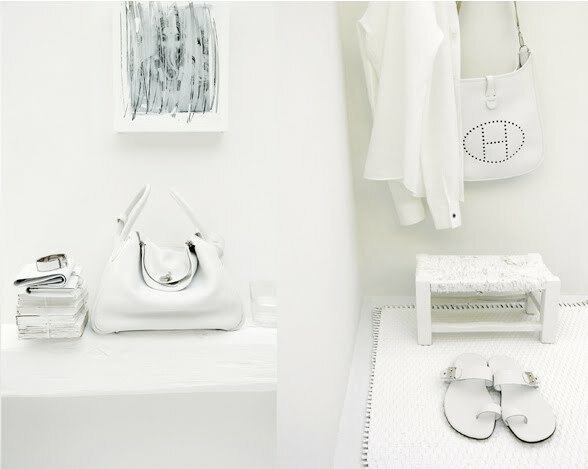 Beautiful photos…and yes, the Hermes bag in the first photo is so great. Inspiring indeed. I’m not even close to choosing a favourite photo. Previous PostI want the stars and the sweeties too….